Another – early – Roger the Chapman mystery (making a total of four now reviewed on this site: the others are The Wicked Winter, The Burgundian’s Tale, and The Prodigal Son). The problem is Duke Francis of Brittany. If he gives Henry his support, then England could be faced with a major invasion. King Edward has written a letter to Duke Francis and entrusted it to his brother Richard, later Richard III and murdered by that same usurper, Henry Tudor. Richard has brought the letter to Exeter, where he is to meet the Royal Messenger of Edward’s choice, a certain Philip Underdown. There, hearing that Roger is in town, he asks him to accompany Underdown to Plymouth and watch his back and see him safely aboard the ship that will call for him in two days’ time. The Lancastrians are after Underdown in order to prevent the letter reaching Duke Francis. The Woodvilles are after him because they believe he knows something detrimental to the beautiful but unpopular Queen Elizabeth (Woodville). And he has deadly enemies of his own. Reluctantly, Roger agrees – he has little choice – and they set out for Plymouth, where they hear that the ship has been delayed, so they take shelter in a manor house out in the country, not far from Plymouth. There, Underwood soon gets into trouble chasing the women, a young bride with a jealous husband, and a widowed housekeeper who takes a maternal interest in Roger but is still certainly very attractive. After two attempts on his life, Underwood hands the letter over to Roger, saying it will be safer with him. But will he be safer with it? 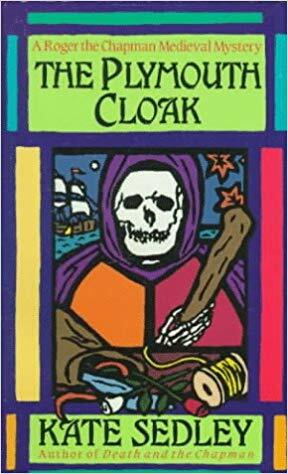 Then Underwood is in fact murdered, and with Roger’s own cudgel – the “Plymouth cloak” of the title. Roger is left with the King’s vital letter to deliver, but is not allowed to leave as he is, naturally, one of the suspects. An excellent story, and another vivid look at the period of the Wars of the Roses and Richard III. I like this series more and more with every volume I read.